Keywords: Cancer, epigenetic, genomic, microRNA biogenesis, microRNA downregulation, microRNA, processing, transcription. Keywords:Cancer, epigenetic, genomic, microRNA biogenesis, microRNA downregulation, microRNA, processing, transcription. Abstract:MicroRNAs (miRNAs) are short, non-coding RNAs that regulate gene expression at a posttranscriptional level. Each miRNA controls the expression of multiple messenger RNAs (mRNAs) and their dysregulation has been implicated in multiple cancer phenotypes. 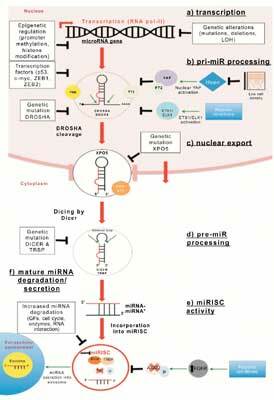 While some miRNAs are upregulated, global downregulation of miRNA expression is often the rule in cancer. A multitude of potential mechanisms drive aberrant miRNA expression in cancer; miRNA coding regions can harbour genomic defects including mutations, amplifications or deletions, and some miRNAs are broadly repressed by transcription factors such as Myc or have epigenetic modifications to their promoter regions such as hypermethylation of CpG islands. Additionally, the suppression of components of the miRNA processing machinery has been shown to reduce mature miRNA expression and contribute to the malignant phenotype. Understanding the mechanisms driving miRNA downregulation is important in uncovering the critical and complex role of miRNAs in cancer biology. This review will outline the multiple mechanisms by which cancer cells suppress miRNA expression.